Trewortha marsh | Launceston Then! Trewortha Marsh by A. B. Collier. A pleasant excursion may be made from Launceston to Trewartha Marsh. This occupies the site of a lake, but it has been filled by detritus from the granite tors around, and this rubble has been turned over and over by tin-streamers, who not only extracted the baser metal, but also gold. On the way Trebartha is passed, one of the loveliest sites in England, second in my mind only to Bolton Abbey. It is the seat of F. R. Rodd, Esq. The parish church of North Hill is a foundation of St. Tighernach or Torney, godchild of S. Bridget. 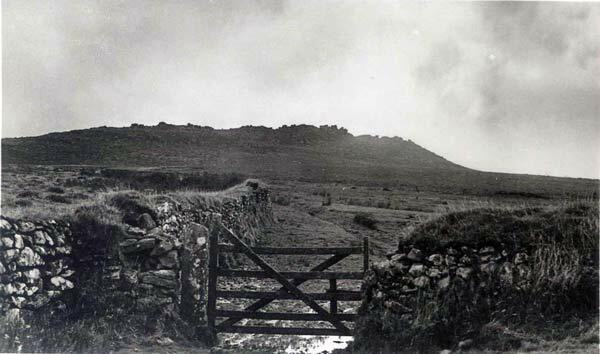 There are two ways up to Trewortha : one is by Higher and Lower Castick, where a picturesque old farm is passed, by Trewartha Tor, on which is shown King Arthur’s bed ; the other is by the bridge at the back of Trebartha. The stream flowing from the marsh forms a really beautiful fall in the grounds. The marsh itself and its surroundings are desolate, but Killmar (Cel-mazur, the great place of shelter) rising above it is a noble tor, and the view from the north-west, by Grey Mare Rock looking over the flat marsh to Killmar, is as fine as anything on the Bodmin moors. On the west side of the marsh is an ancient British settlement, apparently unconnected with the stream-works for tin. 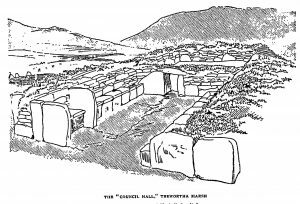 The houses were long and quadrangular ; one was apparently a council chamber, having a judge’s seat in granite and benches of granite down the sides. Unfortunately these have been wantonly destroyed recently by a man who was building pigsties. The houses had separate bakeries, and two or three of these with their ovens remain in a tolerably perfect condition. The same long building was occupied by two or three families, divided off from each other by an upright slab of granite, making so many horseboxes, but each family had its own hearth. The pottery found there was all wheel-turned ; and as many hones were found, no doubt could exist that the occupants belonged to the iron age. No other village of the kind has as yet been noticed on the moors except another somewhat higher up the stream that feeds Trewartha Marsh, and this has been much mutilated of late years. Independent of these singular quadrangular buildings are hut circles belonging to a far earlier age, before steel and iron were known. The whole of the hillside is cut up into paddocks, and a conduit of water was brought from the little stream at Rushleford Gate to supply the settlers with pure drinking water. No traces of burnt slag were found, and consequently the ovens cannot be pronounced to have been made to smelt the ore, but it is strange that there should be several of these ovens. 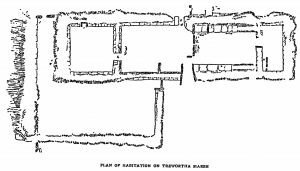 The whole settlement is so curious that I give a plan and a sketch of some of the hovels. The doorways are in several instances perfect. Against the wind and rain the hovels were protected by a high bank to the west. From the Cheesewring, about two and a half miles distant, a line of rails was carried to just above this singular village, and there abandoned. The visitor may well wonder why a railway was carried into the heart of this desolate region ; it was apparently an excuse for wasting the money of investors. The bulk of their deposits have disappeared, and no profits have been realised. 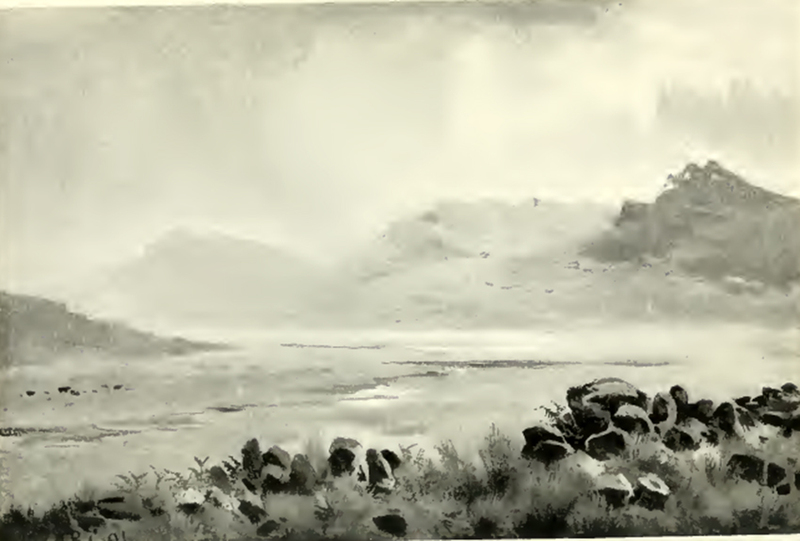 Trewartha Marsh occupies the bed of a lake that decants over a granite lip into the valley of the Lynher. At some remote period the miners cut down the lip and let off the water, and then turned over the lake bed. A former owner of Trebartha Hall gave to his daughters on their marriage heavy gold rings from the precious ore washed out of the gravel of Trewartha. A stroll among the refuseheaps that occupy the lake-bed among lanes of water and stretches of morass will show the visitor how great was the industry of the ancient streamers. There are several cairns and barrows on the heights, but none that have been explored have given other results than small stone cists containing bone and wood ash. On the north side of the marsh were some old cottages, that have been destroyed, and their materials employed for building purposes, in which coins of Elizabeth and Queen Mary were found. A vague tradition exists that a town existed at Tresillern, one of the reaches of the lake, which was submerged for the iniquity of the inhabitants.